This has to be one of the most useful alarms we have seen for a long time. It comprises two units, a transmitter and a receiver. The transmitter is battery operated and designed to be site outdoors across a driveway or area you wish to protect. 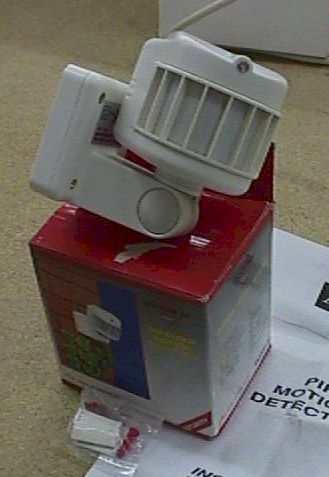 The built in PIR will detect people and cars moving across in front of the detector, effective range about 6-7 metres. In the event of the unit being triggered the transmitter will send a radio signal to the receiver which can be sited up to 100m away! The receiver is also battery operated but can be used with a plug in powers supply if required. The receiver will emit a loud alarm sound for approx 5 secs when a signal is detected from the transmitter. It also features am LED that will remain illuminated until the reset button is pressed. 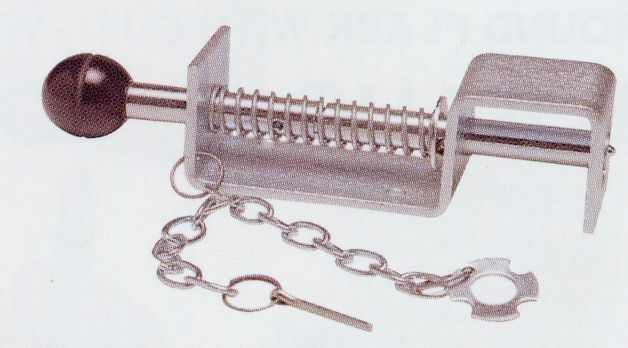 Receiver measures 130x80x40mm both units are designed to wall or post mount. Receiver runs on 3 AA batteries, transmitter on 1 PP3. Somewhat unusual item, probably best suited to your garden or possibly on your desk. 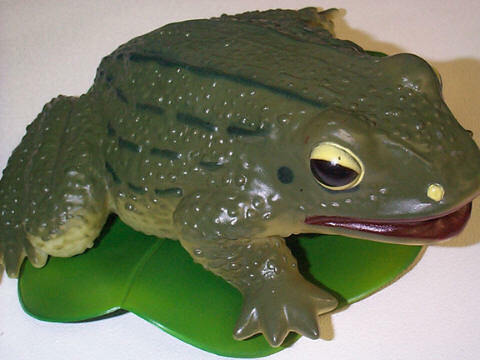 The 'frog' will croak when someone (or something) moves in front of it. Quite large (200x220x90mm) and supplied with a Lilly pad for total authenticity!! 2xAA batts required. These brand new swivel mounting PIR units will switch up to 2 kilowatts. Adjustable sensitivity, light level and time delay (9 seconds to 10 minutes), 15m detection range, mains operated, waterproof. 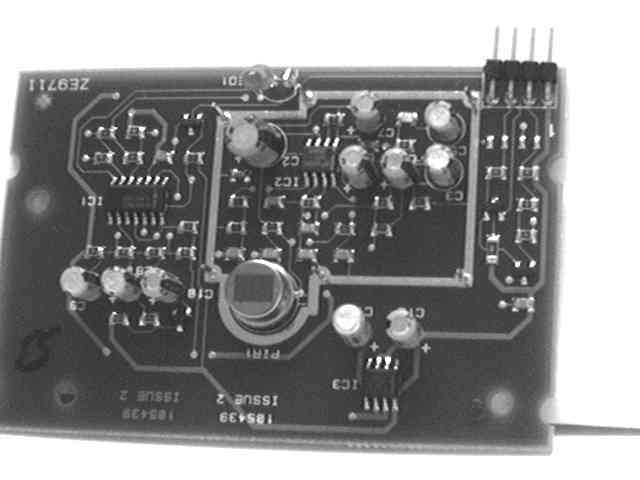 This module is designed to pick up thermal infra-red signals caused by a moving heat source. Typically, this would be a human, however this type of sensor will respond to any moving heat source with well defined edges. The module has an on-board voltage regulator which enables it to operate from 10 up to approx. 14 volts without damage. 12 volts is the recommended supply. It is important to note that the open collector output is taken from just before the LED driver transistor ; this means that with no resistor between the output and Vcc the LED *will not work* ! This resistor should be 1000 ohms for 12V operation. (see diagram) In its present form, this sensor has limited range (typically a few cm) and is highly erratic due to swamping. It has been discovered that adding a non-conductive cylinder to the bare sensor, the range may be extended. Exclusive to Bull Electrical is this new kit that will fill a room completely full of smoke in a few seconds! Not only that but you can trigger the unit with a simple 12v DC supply! This includes a 12v triggering module and 20 smoke canisters. Each canister will fill a large room in a very short space of time! This includes a smaller smoke canister than type 1, more suited to equipment 'fires'? etc. 20 small smoke canisters 1 trigger module. This includes a 12v triggering module and 3 smoke canisters. Each canister will fill a large room in a very short space of time! 3 smoke canisters 1 trigger module. Don't drop one in somebody's barbecue! The SolarGuard SG4000 system is a feature packed security system for any home, office, or utility building. It is factory set for you and basic security functions can be achieved in a matter of minutes requiring only a simple keypad code change. 2 way dial up allows you to set the system to call your mobile or office (4 locations max.) should the system be activated. 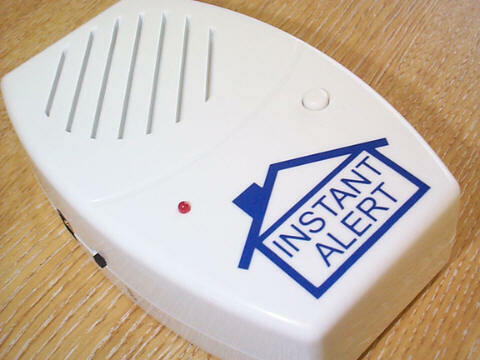 You can also dial-up at any time your alarm and check status and listen in to your property. Our SolarGuard Multi-Zone control panel based system is the best of the bunch combining the latest zoning abilities with a totally wire-free operation. Incorporating the revolutionary MU5850 control panel means you also get flexible operation including the ability to exit through other doors, and a dedicated chime zone - a great feature for protecting doors, garages and sheds at night. As well as twin sirens fitted to the external SolarGuard it provides a built-in siren on the control panel which features entry/exit warning beeps and a useful audible test mode for checking detectors. 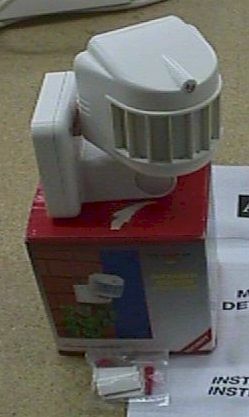 • 2 PIR detectors included - and add as many as you like! Complete Wireless Alarm System An installers favorite - this alarm incorporates fully wirefree sensors with a traditional hard wired bellbox. For those who cannot resist the temptation to go wireless this system incorporates both wired and wireless technology. 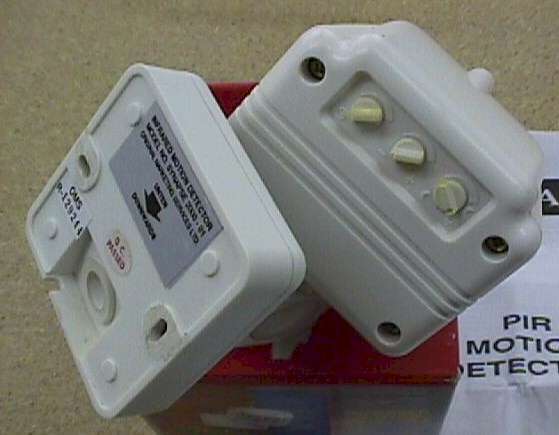 Whilst the detectors are fully wireless and the control panel operates from remote control, the external siren unit retains that traditional wired connection. Upgrade this system with the ST01 Xenon Strobe Unit and it latches and remains flashing in the event the system is triggered - just like the wired systems. SolarGuard is the original solar powered wire free alarm AEI Security and was first registered with the UK patent office in 1996. You choose how you want to configure your system and don’t worry about changing your mind later because weve designed this kit to be upgraded to full control panel operation. Buy this system and you are on the right road to protection regardless of what you choose in the future. • 100% Wirefree - no wiring at all!